Over the past 10 years, advertisers have spent $1.72 billion on the Super Bowl, according to social media monitoring firm, BrandWatch. From Twitter to Tumblr, more brands are looking to extend the shelf life of their three to four million 30 second spots with hashtags, @sweeptakes and the like. How to keep up with it all can get dizzying. So BrandWatch this year as set out to create a dashboard that allows you to monitor the buzz for all 70+ ads that will be running during the game. Brandwatch Superbowl 2012 allows you to visualize the level of online reaction each Super Bowl XLVI sponsor is receiving up to and during Sunday's game. Having already tracked nearly 2 million tweets, it shows you how the velocity of tweets is trending over the past 4 weeks for each brand and what the overall sentiment of those tweets is. So far, Volkswagen, with nearly 14,000 tweets on its $7 million ad spend, is leading the pack. 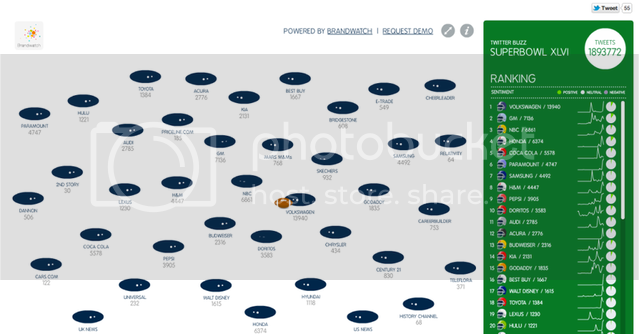 Check out BrandWatch Super Bowl 2012.